Hello there and thank you for stopping by! 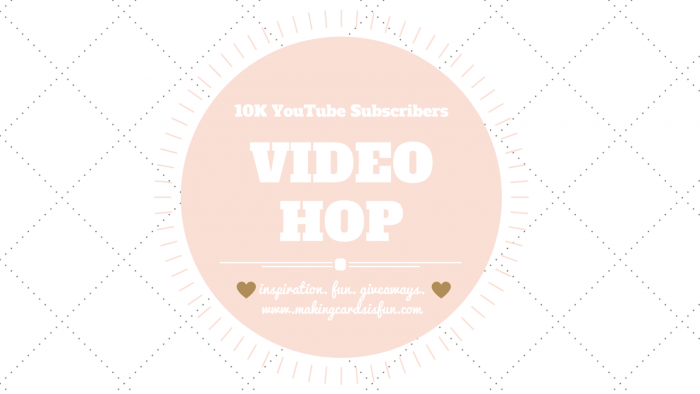 Today I’m joining a fun celebratory blog hop organized by Laura Sterckx to help celebrate her Youtube channel reaching 10K subscribers! The blog hop is happening over on Youtube (this is a link to the first video in the hop) and there are a lot of talented designers sharing beautiful and inspiring projects, so be sure to join (there are giveaways, too)! 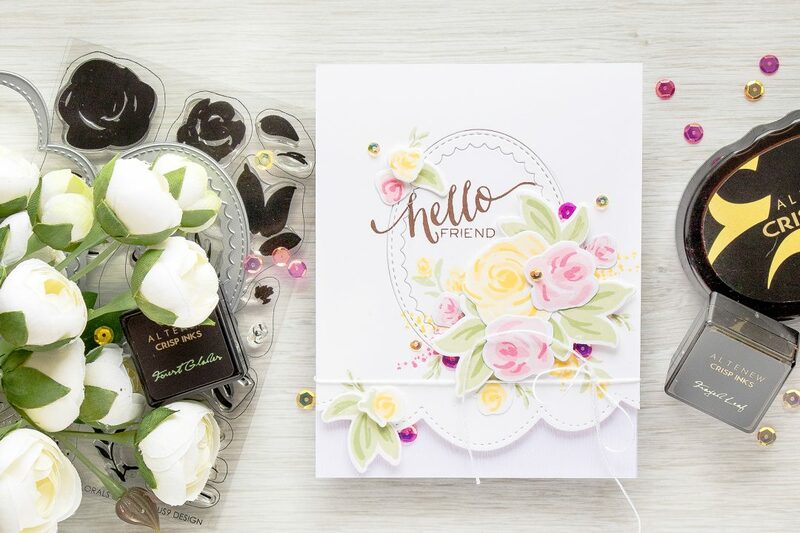 I wanted to create a simple card and incorporate several flowers that appear to be hand painted and WPlus9 Freehand Flowers stamp set was perfect for this occasion! I used my Altenew inks and went with a rather traditional color combo fo any floral arrangement – yellow, pink and green. The reason I chose this brand of ink is because they almost do not stain stamps and I wanted these flower stamps to be stain free (at least for now). Greens: Frayed Leaf and Forest Glades. I also wanted to mention the type of paper I used to stamp these onto – I used Simon’s 120 LB Ultra Thick White Paper; I tried stamping onto other kinds of paper first, but I didn’t like the results. I also incorporated several dies into my project, I used a Scalloped Oval and a Stitched Border dies from Pretty Pink Posh. 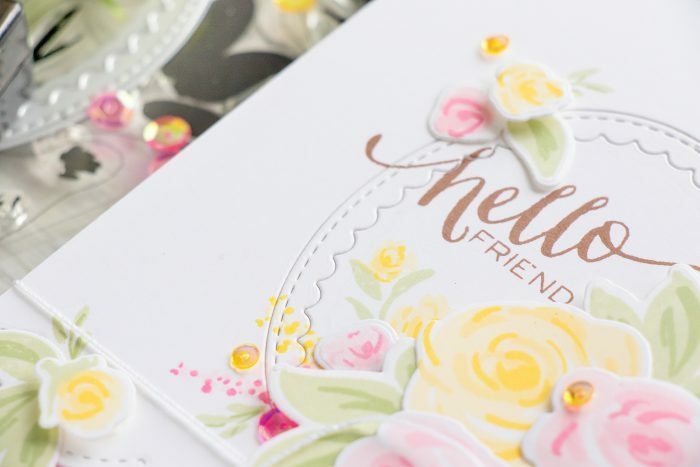 The scalloped Oval was inlaid into my background panel as it works a frame around the sentiment and the flowers and helps bring everything together. Our blog hop is happening over on Youtube, so be sure to head over there! I am the last stop on this hop, if you’d like to start from the beginning, please go to Laura’s video. Yana Smakula – this is me! There are lots of giveaways and lots of prizes to be won! You have to subscribe to Laura’s Youtube channel and leave comments along the VIDEOS of the hop in order to win the prizes. The giveaway ends on Monday, September 12 at 11:59 p.m. Central European Summer Time. Winners will be announced on Laura’s blog. Create A Smile Stamps: €20 Gift Voucher | Ellen Hutson: $25 Gift Voucher | Hallmark Scrapbook: $50 Gift Voucher | Lawn Fawn: 1 Stamp Set + 1 Paper Pad of the Winner’s Choice | The Ton: $25 Gift Voucher | Winnie & Walter: Two (2) $50 Gift Vouchers | WOW! 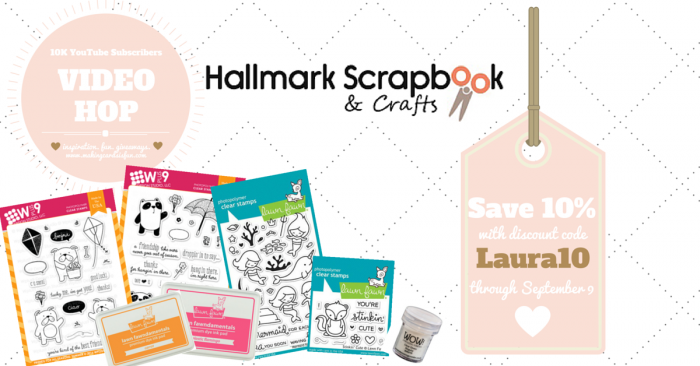 Embossing Powder: 5 Powders + 2 Stamp Sets from their Newest Release | WPlus9: $25 Gift Voucher | Hallmark Scrapbook is not only offering a giveaway, they are also providing everyone with a coupon code! The coupon code is Laura10 and it will give everyone a 10% discount off their order through September 9th, 2016. Very beautiful! I have this stamp set but it has not seen enough love. I will pull it out today. You call this simple, I call this beautiful and elegant! Absolutely gorgeous! Thank you for sharing your beautiful card with us. 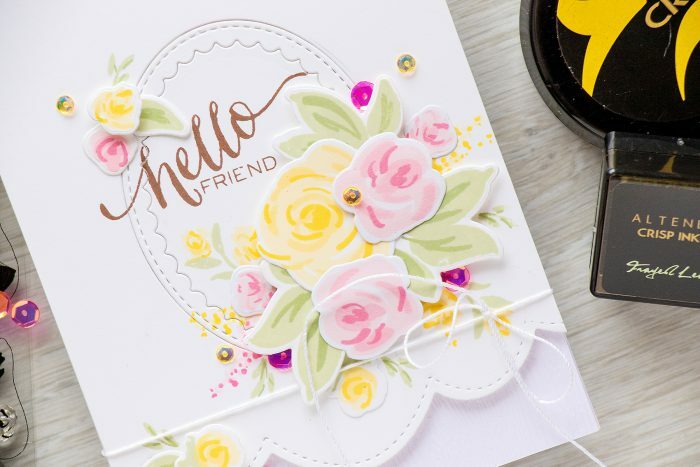 I do love the layered flower technique you used the layout is wonderful. The card maybe simple but that’s what makes it special. Sometimes a card can really inspire a whole new spark in me , this is one of those ❤. Thank you Yanna ! Absolutely beautiful card, Yana. Surprisingly, I have many of the products you used in creating it, so I’ll be giving it a try very soon! Another great card! I always love watching your videos! Congratulations to Laura! Gorgeous card. Super video and I have saved this post/video for future reference. Hi Yana, it’s stunning! 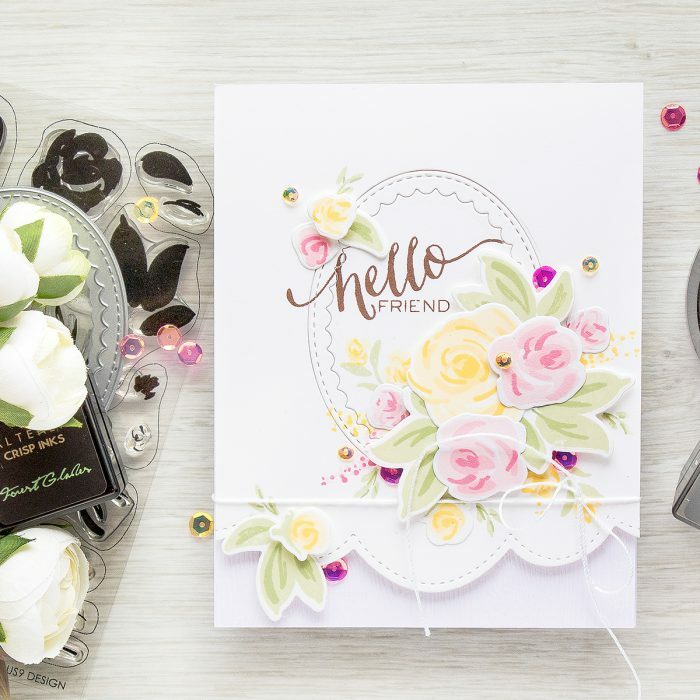 I love this flower set, and the scallop die, they’re so feminine and dainty. I like flower cards, they’re my favorite. Thanks for sharing and inspiring. Laura congrats on hitting 10k, that’s amazing. You’ll be celebrating 20 before you know it. Love,love this card. Lovely design. Very beautiful card. I always love your cards. Just beautiful Yana. Thank you. this is so pretty! I love your style!!! Another beautiful card from you. I absolutely love your cards. 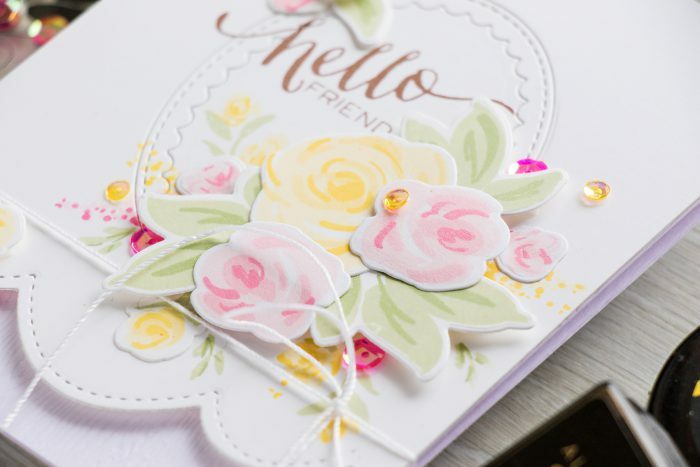 Lovely card – thanks so much for the video!! So so pretty and soft! Yana, sometimes a card just hits you, with no explanation. I’m not really a pastel person but this is one of the loveliest cards I’ve seen in awhile. Thank you for sharing it with us. Hope you are settling in at your new location!! Tú trabajo es bien bello! Beautiful and elegant card. I love it. Congrats to Laura on her 10,000 subscribers! Awesome! Very beautiful card! So elegant. Love soft colors and design! Elegant. I love the color combinations you chose. Thank you for sharing your creative process for this card.